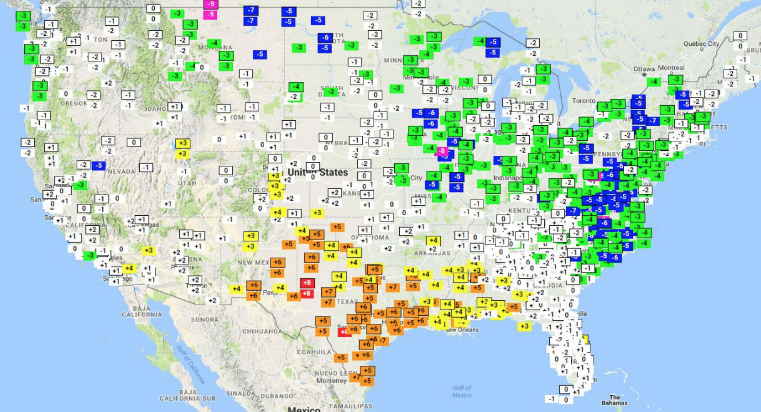 Spring came early to parts of the south-central US this March with an abundance of dry weather and subsequent warmth. Just a hop, skip, and a jump away from Houston is the town of Sugar Land in Texas – our spot for warmest city this March. 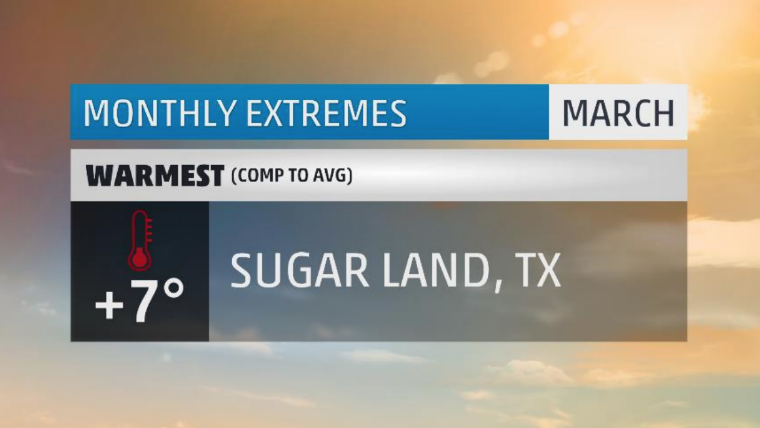 This was Sugar Land’s warmest March on record at just a hair over seven degrees above average. Twenty-four days ended with above average temperatures including twelve days that were at least 10 degrees above average. Twenty-three of those days had high temperatures above 70 degrees and eighteen of those exceeded 80 degrees. Both of those are records for the greatest amount of each in the month of March. The Texas town also set its 4th warmest March day on record at a balmy, summer-like, 87 degrees. It was also warm overnight with 21 morning lows staying above 55 degrees – that’s the third highest amount of such warm low temperatures. In all, seven daily high temperature and five warm low temperature records were tied or broken. Yes, everything is bigger in Texas, even the temperature. 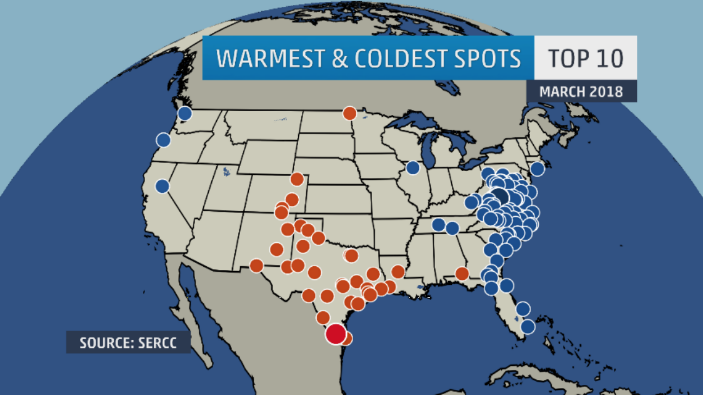 For the 2nd month in a row, the coldest place in the US is Havre, Montana. We bought balloons for the occasion, but they just shriveled and sank in the cold air. Of all the superlatives you can get in back to back months, coldest place seems like quite a slap in the face from Mother Nature. 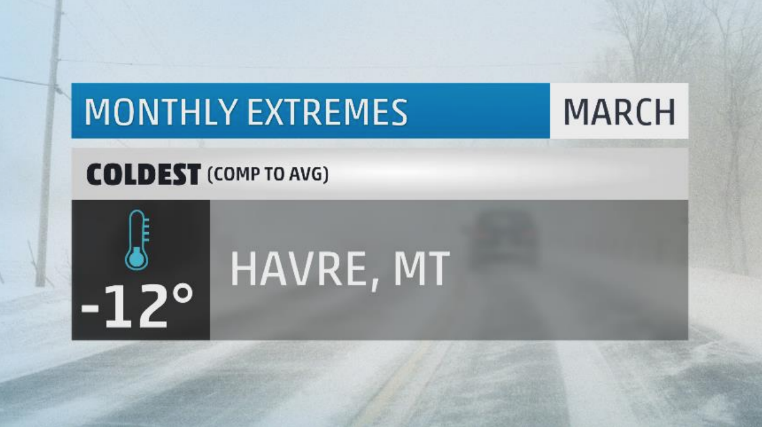 For all the accolades, at about twelve degrees below average, Havre only managed to ring up their 17th coldest March on record. However, it was the coldest March in 16 years. Thirty days ended below average including 15 that were at least 10 degrees below average and 7 that were at least 20 degrees below average. Havre spent 16 days in March at or below the freezing mark and 7 nights dipped below zero. If you go back to February, there was a 23 day stretch ending in March where the temperature stayed below freezing. What supported all this cold? How about 42 straight days of a snowpack at or above 20 inches! Twenty- two of those days spilled into March and essentially acted as nature’s refrigerator for the city. The 42 days stretch is a record for longest sustained snowpack of that magnitude. Either way, we should send some warm thoughts to the folks of Havre. Spring has to come some time, right? 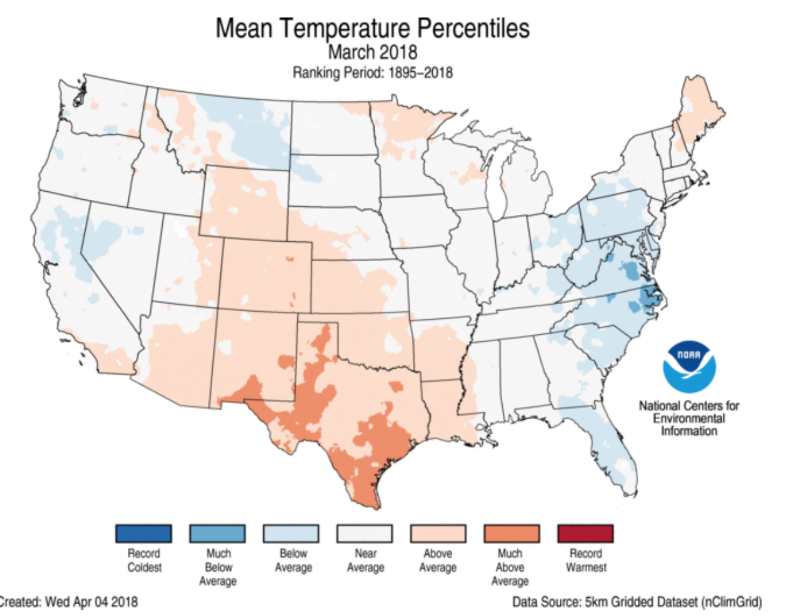 The end of February was incredibly warm in the eastern half on the nation. The switch flipped in early March, allowing cold air to spill from Canada into the intermountain west, Midwest, and east. By the end of the month, some moderation had taken place as the pattern allowed Pacific air to filter into much of the country. The only place heat could hang tough was in the southern US, where drought has also become an issue. A pattern with such ups and downs makes it difficult to hold on to temperature extremes. The introduction of flow off the Pacific Ocean also brought much needed moisture to those west of the Rockies. California, in particular, had quite a wet March as a result. Our wettest spot in the US this month does hail from the Golden State and is nestled along I-80 heading up into the Donner Pass. That town is Blue Canyon. Sitting at about 5,000 feet above sea level, this windward side mountain town is no stranger to heavy rain episodes. This March was their 10th wettest on record with an impressive 16 inches of rain. Seventeen days saw measurable rainfall with five seen at least an inch. While snowfall data does not exists for Blue Canyon, given a temperature profile that regularly hovered above and below freezing during some of these precipitation events, I would venture a guess that much of this fell in the form of heavy, mountain snow. Nearby ski resorts, which do not make official observed snow reports to the National Weather Service, saw as much as 10 to 20 feet of snow (though at slightly higher elevation). This showcases the dynamics at play when you draw moisture off the ocean and throw it up against a mountain range. On the windward side you get substantial rain that can last for weeks and lead to flooding, mudslides, and the like. Just over the mountain, on the leeward side, you can find many areas that are almost desert-like. It’s the feast and famine of mountain ranges. 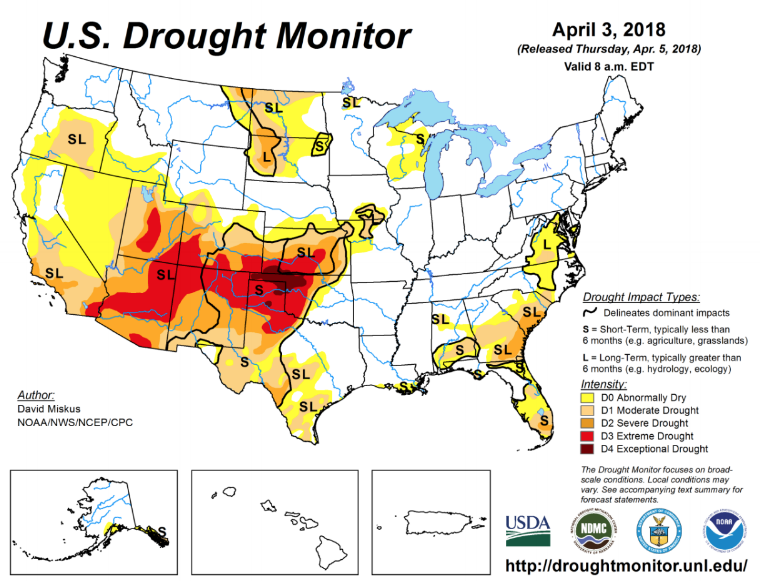 While March’s heavy rain has helped ease drought conditions in parts of California, an extreme drought remains in areas stretching from the Four Corners region to the Great Plains. Here, some places have gone hundreds of days without seeing a drop of rain. This is also introducing a widespread wildfire danger that could plague the area for months. The southeast is another area where drought has worsened during the month of March. This will be another area of concern as we head into the long summer months where rain can be scared outside of tropical threats. Wintry weather, which was rather absent from the northeast in February, returned with a vengeance in March as three back-to-back named winter storms rolled through the region. 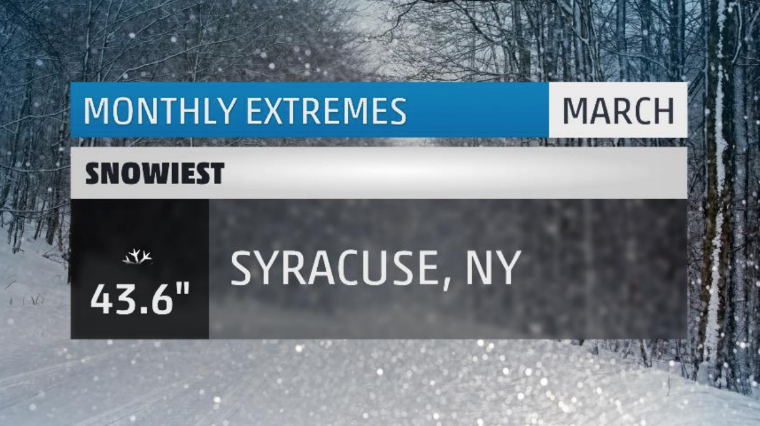 At the epicenter of each storm was Syracuse, New York – our snowiest place in the US this March. 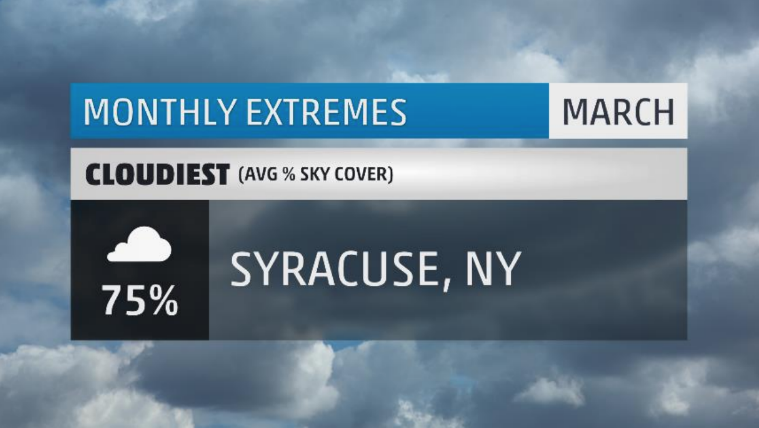 For Syracuse, this was their 3rd snowiest March on record and hosted twelve days with measurable snowfall. The front 16 days of the month featured three back-to-back named winter storms that each brought their own unique punch to the region. The first was Winter Storm Riley which opened the month by dropping 16 inches of snow in Syracuse. Just a few days later, Winter Storm Quinn brought another 7 inches. Right on Quinn’s heels was Skylar which dropped close to two feet, making for a whopping 43 inches of snow in just 16 days. This was Syracuse’s snowiest March since 2001 and is currently their 11th snowiest winter with 151.1 inches. 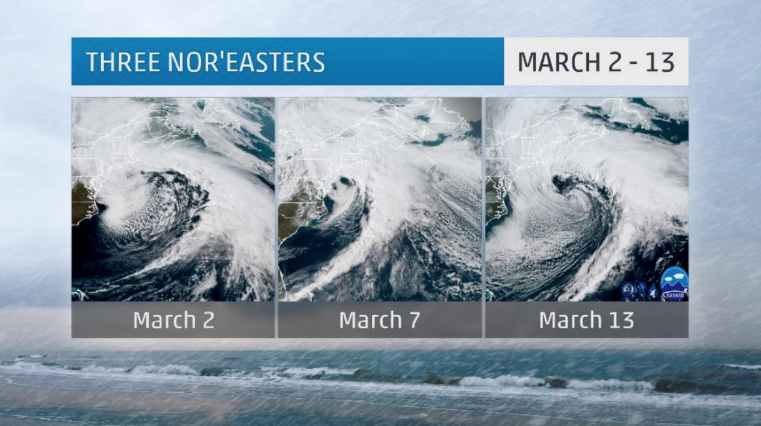 What a sight – a three-pete of nor’easters in a span of just two weeks. The storms not only brought heavy snow and wind to the interior northeast, but wreaked havoc along the New England coast with onshore flooding and beach erosion. 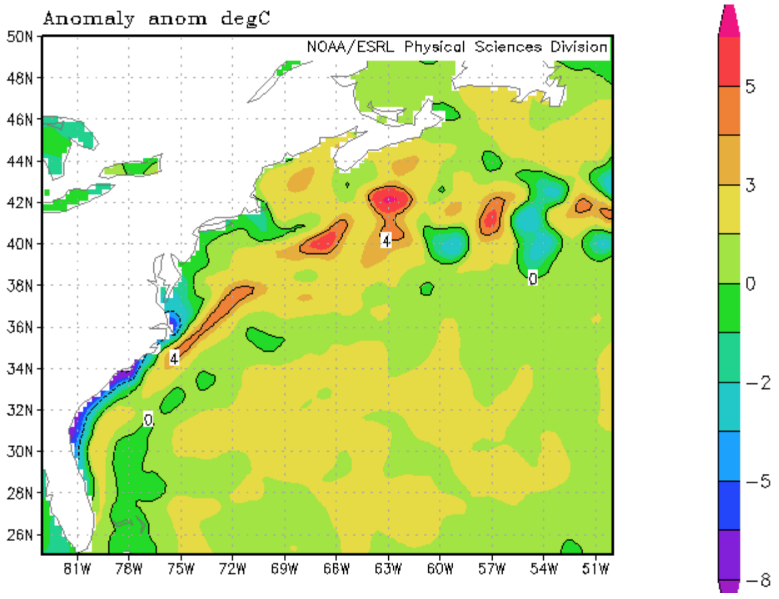 The culprit may be some abnormally warm waters just off the New England coast. Here waters are 3 to 5 degrees Celsius above average! That’s some quality fuel for winter storms. In the heart of the significant drought region, where dry weather is all too abundant, you would expect to have rather persistently sunny weather. 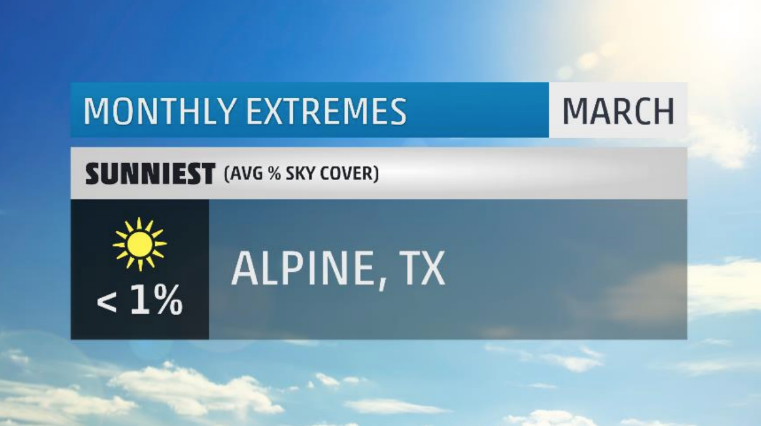 Such is the case for this month’s sunniest spot in the US: Alpine, Texas. The bubble of “stuck” weather brought 29 full sunshine-y days to Alpine with just eight- hundredths of an inch of rain for the entire month. Drought aside, Alpine is no stranger to bright, blue skies. On the average, they see 247 sunny days per year, which is well above the average for the rest of the US. Our snowiest place was also our cloudiest place this month! With all those back to back snowstorms, Syracuse essentially started the month completely overcast for the first 16 or so days. While the pattern would shift enough to bring sunnier weather to the region by the end of the month, the front end was gloomy enough for them to hold on to the top spot. 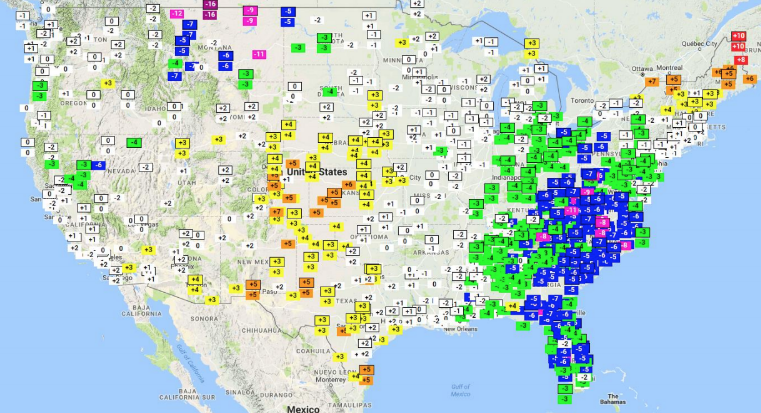 One note, Syracuse is actually the 8th cloudiest city in the US. Perhaps it should be no surprise that we see them on the list here from time to time. 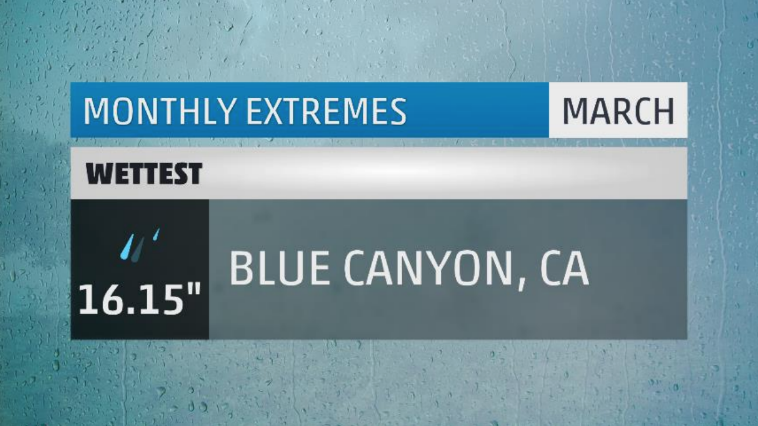 There you have it, the extremes for the month that was March 2018. Make sure to check back next month to see what April has in store! 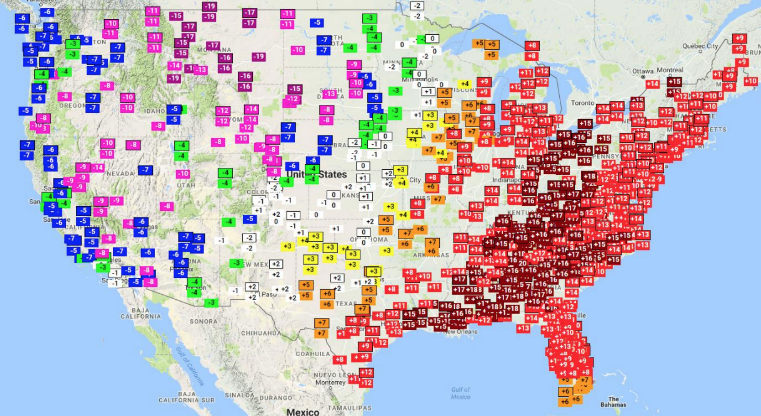 What weather extremes did you face in March where you live? Let me know in the comments below. Honestly, ya’ll should include a satellite picture of the storm just off the coast in late march. Was that not historic?